Genuine Year Coin Sets, from 1911-1989 - the ideal commemorative gift! Our coin specialist is a 30-year veteran of the international coin trade and runs one of the top-ten coin businesses in the UK. 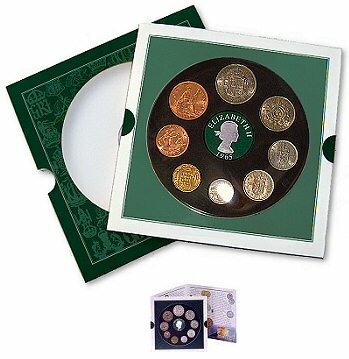 Here we present a fascinating and nostalgic product range which features complete sets of original British coins minted in each year from 1911 to 1989. These products make the perfect birthday, anniversary or commemorative gift. We also sell a range of collectable Monarch Sets whose coins are selected for each British monarch, starting with Queen Victoria. Year coin sets 1911 to 1964 and Monarch Sets of Victoria through to George VI contain carefully-selected circulated coins. Those of 1965-67 and Monarch sets of Elizabeth II contain mint coins, and those of 1970-1989 proof or mint coins. Our coin sets are presented on an attractive mount in a colourful wallet, and include a concise narrative detailing coinage changes since 1893, and a rare coin reference guide. Prices for the sets reflect differing numbers of denominations issued in given years, the availability of scarcer-date coins, and silver content.